Once upon a time there was a woman with a home office in what was originally the master bedroom of the house she and her hubby and her cats lived in. That woman was me. Ignore the kitty litter in the hallway on the right. And yes, that is a USB TARDIS on top of the computer and a string of star lights draped over the monitor. Behind the desk was what was referred to as the "printing nook". In its former life it was the closet. It held a black cabinet full of office supplies with a heavy as sin colour laser printer on top that I could not afford the toner for. The desk jammed in the closet beside the cabinet was pretty much there to hold the plastic bin the cats liked to fight over who got sleep in. First step, empty the closet. If you look carefully, you can see the cat in the plastic bin, which is why that was the last thing to be moved out of the closet. Next, strapping for the shelves. Yes, the inside of the closet was papered and no, I did not strip the paper off first. I think that paper was applied with cement and it would have taken forever to strip it off. 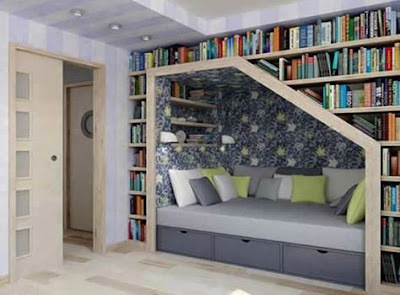 And also, no one was going to see the walls because duh, bookcase - there would be wall to wall books in front. It was actually at this point I started to get a little nervous about the whole project. The general shape of the closet looked different from the one in the original picture. And the closet itself was more open, meaning there wasn't as much edge for the ends of the shelves. So you'll notice we had to kind of extend the width of the door frame. Once the strapping was in place it was time to paint. I chose black because everything else in my office was black - desk, chair, filing cabinets - and I wanted it all to match. The nook in the original picture looked to have drawers in the bench, although frankly they looked more ornamental than functional. While I did want to be able to store stuff in the bench, I didn't much care for the drawers, so after much consideration, the father-in-law came up with a removable seat for the bench. Finally, after many weeks of hard labour (mostly by the hubby and the father-in-law), and maybe a bit of cursing and swearing (okay, maybe a whole lot of cursing and swearing). 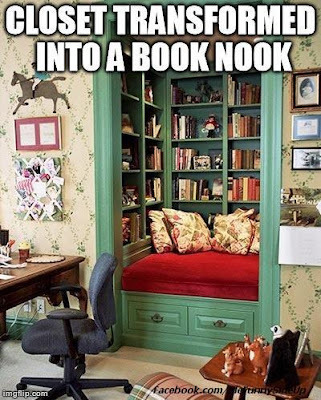 My very own reading nook was finished. All that was left was making the cushion and loading it with books. The book loading was rather time consuming because in an effort to bring some kind of semblance of order to my massive book collection, I decided to use the nook strictly for my science fiction and fantasy books ... which were spread out amongst the other 14 bookcases in the house. 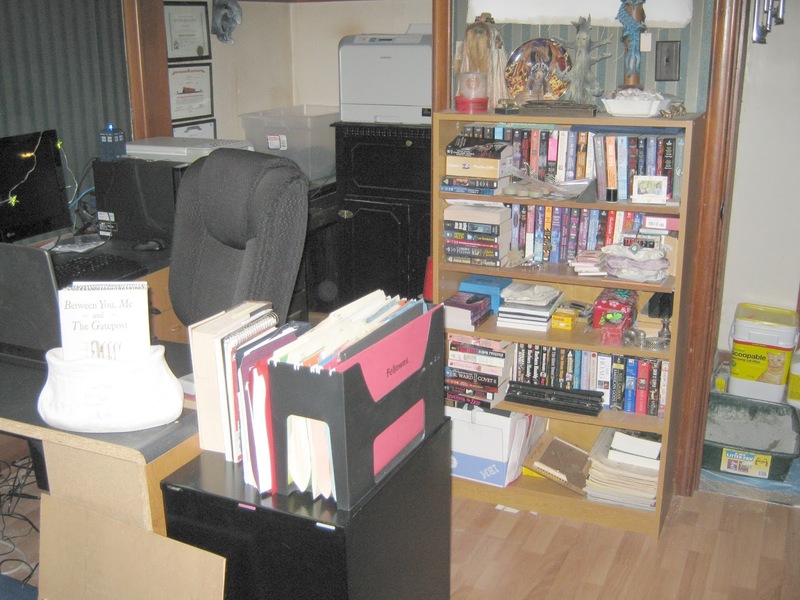 And, just because I could, I painstakingly catalogued these books first - all 681 of them. While I did get some use out of it in the beginning, unfortunately it wasn't long before the cats discovered it. And with cats comes cat hair. Lots of cat hair. And even if I could stay ahead of removal of said cat hair, I still couldn't get to use the nook because there's usually at least one, usually two, cats in there sleeping. And I confess, I'm too tender-hearted to make them move. 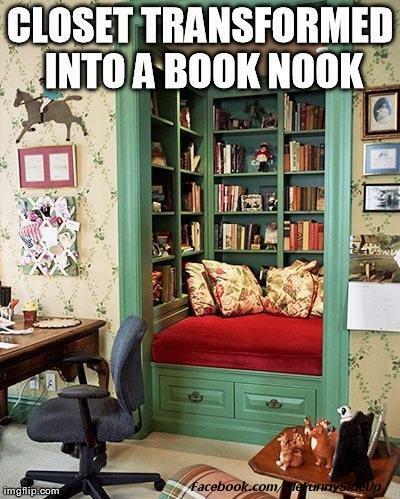 Yes, it is my nook, but they got there first. What a brilliant idea. I shall have to start dropping hints to my husband!